Sometimes, I use the small blocks on top of the Circuit board, Speakers, under Cable Grounds, Transformers, Wires all over the place really. I've even glued them to my walls. The Biggest Cubes are very cool. 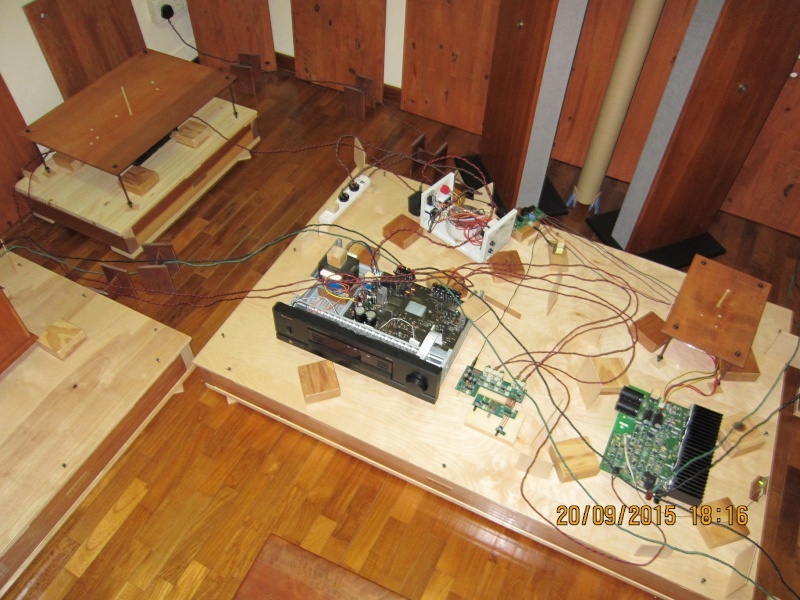 Depending on the laminar flow on the tops of the speakers, I've used them as tuning devices in different positions. I've also put the LTR (super dry) in the mass loading chamber of the 60's. You have a lot of different flavors there to play with. Have you setup the powerstrip yet? The blocks do all kinds of stuff under and on top of them. Not yet I want to enjoy listening to my current lovely system setup a bit longer Most probably this weekend I'm going to setup the Powerstrip. - All the Cubes sizes"
Exactly correct I didn't want to hold up the shippment longer and I knew you would do a good job of voicing. The Balsa and cubes, once you listen to them and give me a report, will be voiced by you according to what you hear. I'll help of course. All this wood is 6 months or so away from taking on their true self, or the beginning of their power. The very first thing I do when learning the wood is place them under a component (CDP). Both your CDP and Amp is light enough to do this with. I usually use the lightest component. 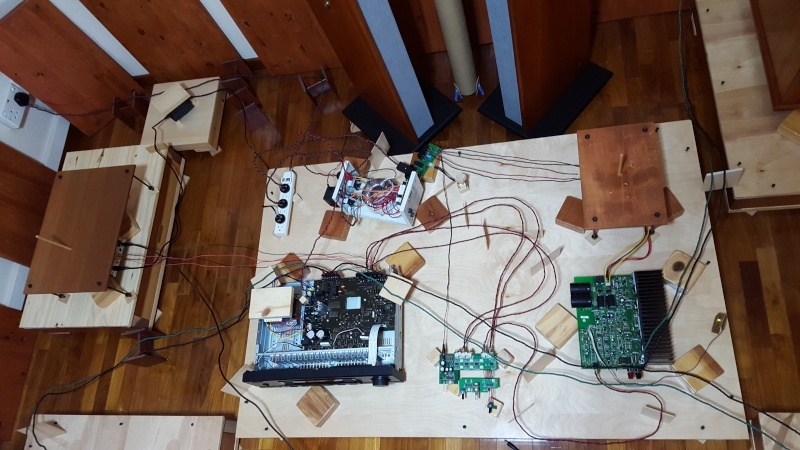 From that point I start placing the wood throughout the system, keeping in mind the general sound of each piece. A method of flavoring will start to take shape as you do this. So, you can first get to know the pieces, or slowly start exchanging some of them. But if you are at a very good listening place stay there until you hear something you wish to voice slightly different. Also stay up with my thread as I will be going more step by step. The power strip should start to produce a bigger bottom in about 7-15 days. Let's see where we are at the end of that time. I'm looking at a few possible tunes. Thanks for that post on the reaction of your JBL and Altec friends! That gives Sonic a good idea of what they heard from your system. Did you play them something that gives holographic 360 degree imaging? If you did, what was their response? In Sonic's experience, the horn loving audiophiles have different priorities from us Tunees. For them, it is the effortless dynamics that thrills them (and it is a thrill) and the fast attack and no overhang in the bass. Soundstage is almost of no consequence to them. When I hear that sound playing back good analog, part of Sonic says they might be right. Sorry, I keep forgetting to post this retro plate for you. As you can see on this particular plate, it screws right onto the speaker. The Viola is made for separate plates to be exchanged, but the Classic would have to be routed out to make this possible and by the time that was done you might as well get a Viola. On the Classic 60 though the way to do this would be to make a plate like the pic that screwed over top what is there. This plate BTW is .25" thick and doesn't look all that bad put on. If you would like I could do another one and start testing driver options for you, but this would be a long proccess, unless I got lucky right off the batt. I would rather see people get the Viola but if they don't mind the cost of a retro and a revoicing plan they would need to do, it's doable. But then again maybe these plates will work just fine the way the Classics are voiced, it's something I would have to test. Oh, BTW George Michael does some fantastic recordings. My fav is Faith, very 3D. The retro baffle plate comes with the screwed holes, is it using back the same screwed holes on my speaker cabinet to mount the plate and without drilling or making any additional holes on the cabinet surface? The retro means creating new holes. Personally I would go the Chameleon route. If I were a serious Tunee who has been waiting for me to finally land on a true ultra MG speaker design and get in on the first few rolling out at that super low price, not to be seen again, I would be checking out my bank account. For those who have followed me from the beginning, you can see how critical I have been on my own speaker designing. Yes, there have been some magical speaker products come out and I'm thrilled that folks get a chance to enjoy them, but with the joining of Harold I have finally reached a level of confidence that someone will build what is in my ears & mind. I have never seen any speaker company build a true musical instrument. There are always compromises made in the designing for the sake of an audiophile selling point and user acceptance. Designers in this hobby quite frankly build speaker products to sell theories. More than any other part of this industry speakers have been that guessing game. I'm not sure that this has been done with ill-intent but it has certainly been done with a lack of understanding accoustic and mechanics. I do respect these designers, but the fact is they haven't gone far enough. 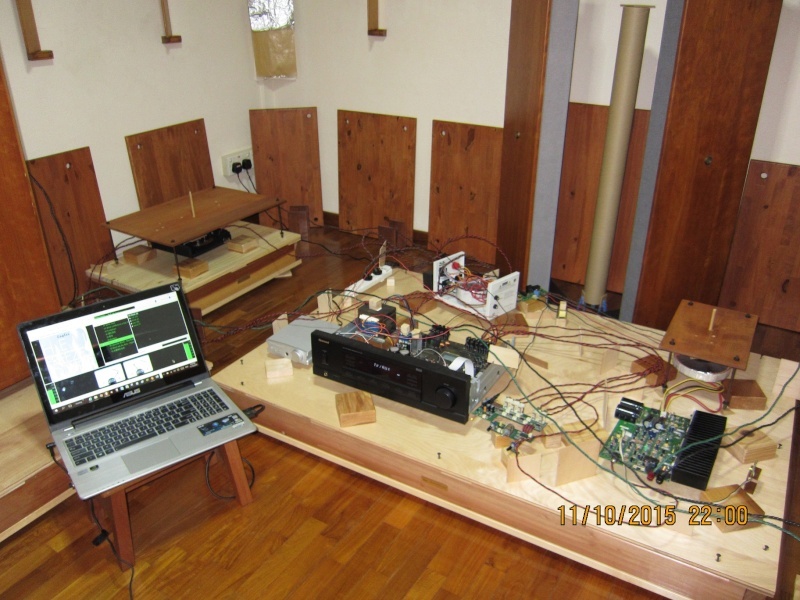 Any audiophile reading this and using my tuning tools knows that there's another step that has needed to be taken in the designing of loudspeakers. I have come close, but without having that woodshop and associates who have the ability to make that woodshop copy my years of learning, close is as far as I have ever got. Coop is the dream guy that Andy has always said needs to come along. Not from the marketing end, even though Coop has done well, but even more the side of going after what is inside of this wildly harmonic eccentric hermit-ish world of mine. Honestly a world I try to hide from most, and a world that is the opposite from the guy you saw in the pics and saw at the shows. The real MG is a guy who has always wanted to achieve the "tune". Not just in audio but throughout science itself. The real MG for better or worse somehow has always understood the motion of physics, the non-absolutes of absolute. Some might call this bragging, but honestly I have no time for bragging on myself. What I do have time for, at this particular time, is the actual ability to have something made and delivered that changes everything about speaker design. The Viola-FS Chameleon is worth millions. It's worth everything I have attempted to realize since my first ultimate speaker. The Chameleon is all about you/us the listener combined with everything that is worthy about wood musical instruments. There's no cliche' about the Chameleon and I finally get to have it made. Thank you RoomTune, Jim Bookhard, Andy and thank you Coop. Most of all thank you Tunees and the Lord for allowing me to see my dream made reality. The Tune is something I was built to do. 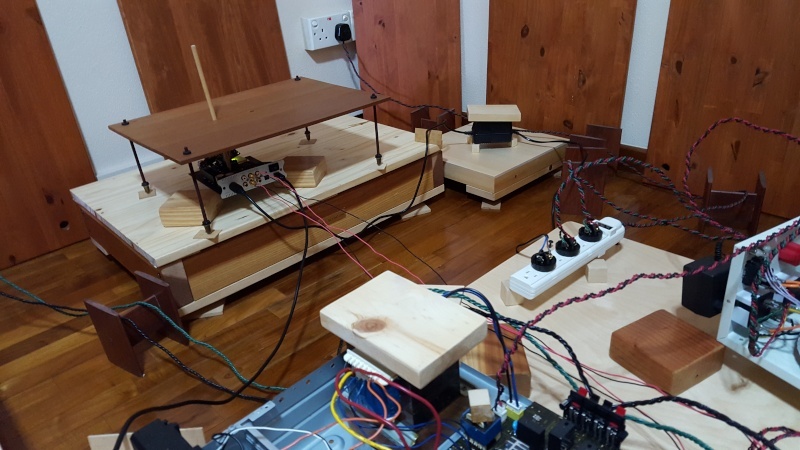 The Tune is not me, but the next step in understanding the ART of physics in action. I don't really know any other way of saying this other than asking listeners to experience the tune for yourselves and let it become a part of your thinking and actions. I hope the day will come when tunable electronics will be the norm and not a freak in the minds who view from the outside. Saying that, we have come a long way guys and now is one of those magical times for some of you. Yep, the Viola-FS Chameleon is something worth putting on the want list. A few of you will get a reduced price, and for those of you who come after, you just bought yourselves a Million dollar speaker. I am very eager and curious to hear back of your impressions on the DAC! I have been spending most of the last 6 months of my hobby with DACS and trying to pick out the best one for a reasonable price. Currently, I have settled on a used Bryston unit and am in the process of building my own Music Server to feed the DAC bitperfect audio. So far, I have progressed to the point my hand built server now exceeds the quality of my NAD 516 cd player. I am going to migrate my progress from Stereophile over to this forum if you or other readers wish to checkout my progress. 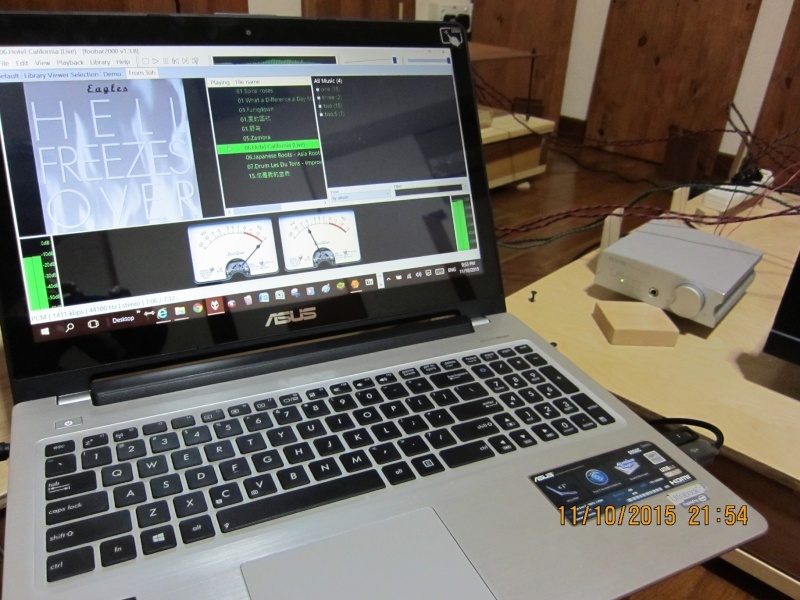 The Aune X1s which I bought was a 32Bit/384KHz DSD128 USB DAC feed thru Xmos USB Audio 32Bit/192KHz driver and using Foobar2000 application as media playback. Just launch 1 month ago. Migrate! Migrate! Sonic would be one to follow your progress on the music server system. Now that Sonic has a reasonable grasp on analog LP, EP, SP playback, some investigation into this form of music storage and delivery must be done. I been avoiding it truth to tell because those systems I heard till now were quite inferior to standalone CD players. But the future of digital music is in server/Network Assisted Systems. There is no escaping this direction. I am happy to see members of Tuneland also embracing DACS as a serious choice. I look forward to learning and sharing with many. As for Hiend001's DAC, it sounds like a very good value... Uses WIMA, Nichicon, and Burr-Brown 1793 DAC..audiophile grade components..hard to find reviews on it though so we will need to lean on your own impressions! As for me, I think I've found a very good value in my older Bryston BDA-1... While it doesn't have the latest tech, it is a fully balanced configuration with dual DACS and supports up to 192/24. And sonic: yes, digital front end players and DACS can surpass many CD players now... These are exciting times! I couldn't locate info on the Chameleon speakers referenced in this thread - could you provide a link? Greetings Hiend001 and Dr Stesiak! Yes, when Sonic hears Hiend001 say the sound of this system exceeds that of the Magnavox that is something I am taking notice of! How did you (Hiend001) go about the transfer of your CDs to hard disk? What hard disk are you using? All Sonic sees is the laptop -- you don't surely store your digital files on the laptop hard disk? Ron, Sonic admires what you are doing with your digital front end. I'll continue the conversation with you on your thread instead of hijacking Hiend001's thread here. I'm using external USB Samsung harddisk (1TB) to store and playback all my media. Could you kindly give a list of your components as shown in your post on Sept 20th, 9:15am? I notice what is probably a vintage Sherwood, but then I also see what is a second amplifier to the front right.. The tell tale cooling fins and large capacitors..I'm also just interested in learning of the other components too. 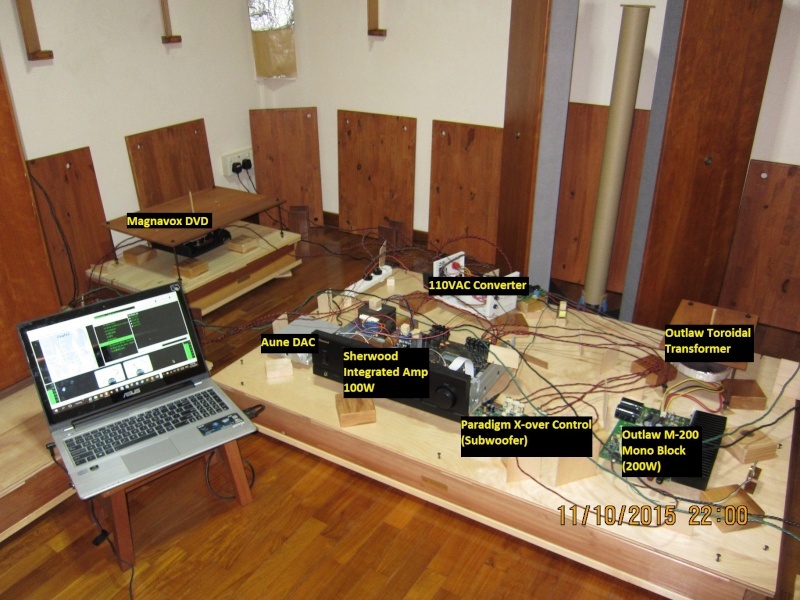 I see a tuning canopy to the far left, and another on the table with the rest of the equipment. I think we all can learn a lot by examining audio components chosen by others and their reasoning behind the decisions. You've got my curiously up! Wow Wow My system sounds getting better and better everyday The imaging with surrounding depth couple with super detail resolution made the music feel sooooo good and real The bass impact was tight with authority I could hear the subtle detail bass notes The digital files format I'm playing were FLAC & WAV. If I can use your ears for a little before and after this would be of big help to me. Also another big help would be if you played something that didn't sound so good, and how you tune it in. I want to know if it's easier for you to tune with the maggie vs the other methods. Ultimately for us is to be able to show folks how to tune any source, but anything I can do to speed up my learning curve by avoiding any audiophile twist and turns is of cource very meaningful for me. I'm enjoying Sonics EQ tuning and can also see the file movement coming quickly. As I said in "97", I see the hobby as being something largly controlled by a screen. Coming up on 20 years since that, are we there For myself, passing up the performance of the Maggie on most counts would be a big step in that direction. In my mind, being able to order the masters would be best. Then being able to do our own engineering, plus EQing. 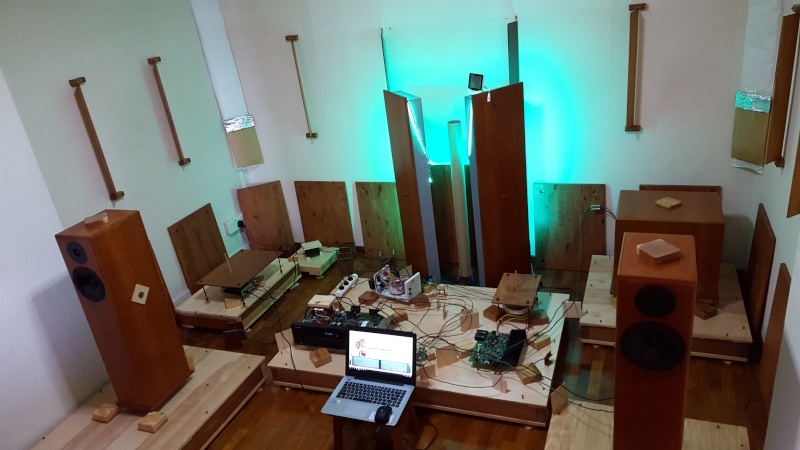 Private tunable concert hall, files and EQing. This could be the moment we have been in waiting for. Not something to be rushed and making mistakes, but something that does afford us the state of the art. I used 31-bands graphic equalizer to boost when playing those didn't sound good. This 31-bands graphic equalizer comes with the Foobar2000 application software. Good imaging on vocal. Warm voice presence but a bit softer. Good dynamic but a bit congested on complex jamming session. Very good imaging on vocal. Solid voice presence upfront like singing in front of me but lack of warm. Lack of harmonic all round. Bass not solid but heavy on bottom end. Good imaging on vocal. Warm voice presence upfront. Good halo with richer soundstage. Will carry on playing different wood types underneath DAC to search for best combination in next few weeks. Also I know Coop wants to see how your DAC is going, cause he is about to pull the trigger on some toys. Thank you kindly for the excellent reply! 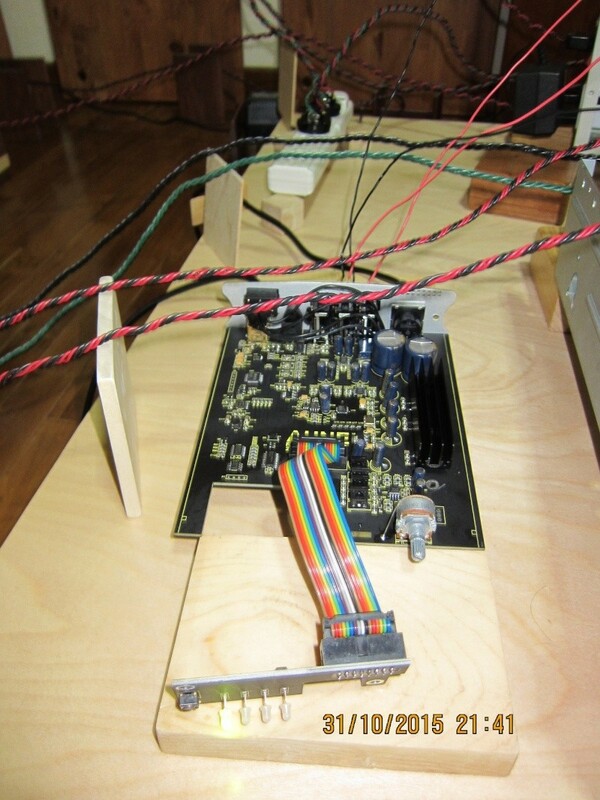 That was a great idea to overlay the names of the components on the picture! 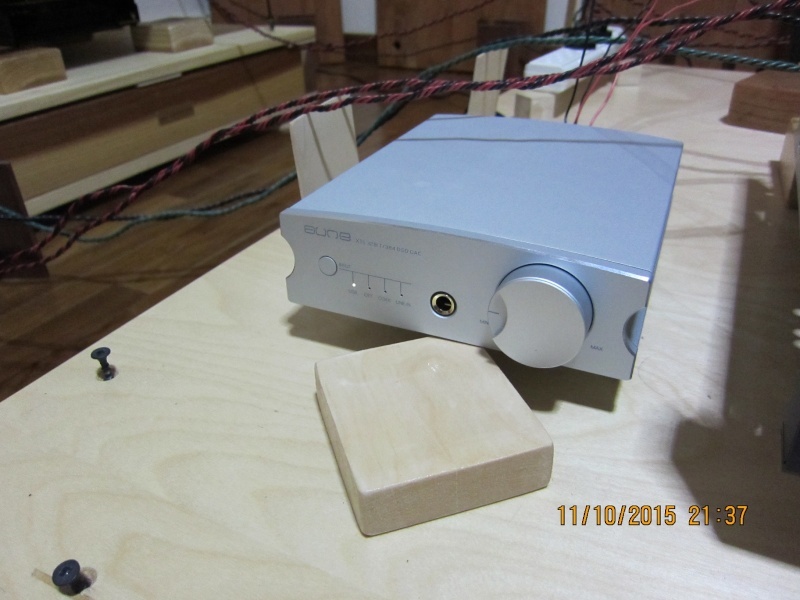 One remaining question on this topic: do you have the first or second version of the Aune dac? I love that it has a tube! wow my links were out of date! Thank you for the clarification! I have re-direct my Aune DAC’s power plug to the powerstrip you have bought for me instead of direct to the wall socket. All the equipment electrical power plugs were connected directly to the powerstrip.